The United States Congress designated the Table Top Wilderness (map) in 1990 and it now has a total of 34,400 acres. All of this wilderness is located in Arizona and is managed by the Bureau of Land Management. The Table Top Wilderness is dominated by Table Top Mountain (4,373-feet in elevation), which abruptly rises above the nearly level Vekol Valley. Lower summits and ridges are covered with talus slopes of loose, blackened boulders and rocks interspersed with columnar saguaro cactus and the occasional stunted paloverde tree. Brief seasonal rainfall is channeled by normally dry ephemeral drainages (or "washes") that dissect desert outwash slopes (or "bajadas") leading to vast and level valley floors. The Wilderness is characterized by two major vegetation communities -- Paloverde-Mixed Cactii, which includes the dense "forests" of saguaro cactus, paloverde, and ironwood trees that presents the classic popular image of the Sonoran Desert, and the Creosote-Bursage community that covers low elevation valley floors in seemingly unbroken expanses. At the summit of Table Top Mountain is a small, 40-acre area of Sonoran Desert Grassland. 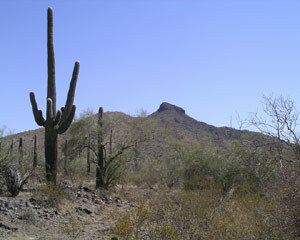 In 2001 the South Maricopa Mountains Wilderness was incorporated into the Sonoran Desert National Monument. Planning to Visit the Table Top Wilderness? How to follow the seven standard Leave No Trace principles differs in different parts of the country (desert vs. Rocky Mountains). Click on any of the principles listed below to learn more about how they apply in the Table Top Wilderness.